Note: Not all products may be carried at all retailers. Our product lines capture our passion for food. We find that the most satisfying meals come from the simplest of ingredients. 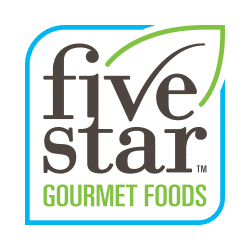 What makes FiveStar Gourmet Different? Our Farm to Table philosophy is a proven culinary technique every good chef employs. We visit the local market daily and bring back the freshest in season ingredients. We are dedicated to managing the limited resources our planet provides. Our use of recycled water bottle packaging has prevented over 63 million bottles from ending up in local landfills. Our insistence on high quality ingredients combined with skilled preparation, is our recipe for true gourmet foods. Gourmet does not have to be exotic but it does need to be the best. We focus on the details in the products we make. The packaging has to be appealing and informative; the ingredients clean and wholesome, and the overall experience should feed the body, mind and soul. We pride ourselves on promoting healthy eating and offering products to match. We see the challenges unhealthy eating has saddled upon our communities, and we want to make a difference. We have been providing food solutions since 1998. We have succeeded by continually exceeding our client’s expectations for exquisite food and extraordinary customer service.